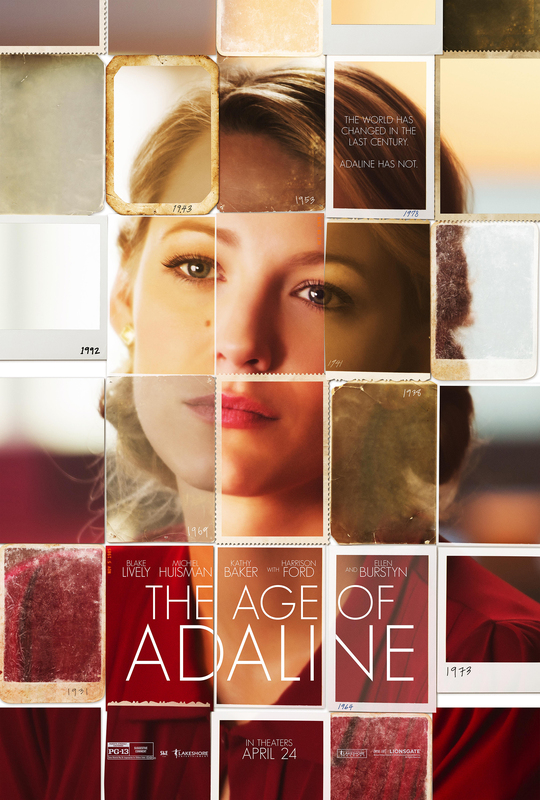 I’m fascinated by time travel and reincarnation and immortals living through different eras, so of course I was intrigued by The Age of Adaline, about a woman who stopped aging in 1937, and in 2015 is, to all appearances, still 29 years old. There is a plot here, about what happens when Adaline falls in love, jeopardizing the safe but rootless existence she’s been living, hiding her past and her…condition from everyone. She also bumps into a decades-ago paramour, played in the present by Harrison Ford, complicating life even further. It’s a pretty good plot, romantic in spots and tense in others, but what really made me love this movie was Adaline herself. Adaline is played by Blake Lively, who I’ve previously only seen in the Sisterhood of the Traveling Pants movies, and I’m so impressed by her here. She was so convincing as an old soul in a young body. Adaline walks with an incredible amount of poise and confidence, and does seem in many ways older than her physical appearance.There’s a nice scene near the beginning, when Adaline is picking up fake documents for her next identity change. She gives the teenager who did the papers a lecture on why he should better things with his talents and stay out of trouble. It’s the voice of a grandmother from the body of a 29 year old, and it really sets the stage for the character. And perhaps all that poise and confidence and old soul-ness makes it even more impactful when Adaline ends up blindsided by emotions she doesn’t know how to deal with. There are also some lovely scenes between Adaline and her 85-year-old daughter, the only one privy to her secret. They pull off a convincing mother/daughter dynamic, despite the obvious age incongruity! Points have to go to the costume department too. I loved Adaline’s clothes. They’re stylish and modern and appropriate for a woman of 29–but she still wears a lot of skirts and blouses, and carries an elegance that definitely echoes an earlier time. She has a rather Audrey Hepburn style, classic elegance that looks good but definitely echoes a woman who’s been living through many decades. Harrison Ford also does a nice turn here as Adaline’s boyfriend from the 1960s, now a good deal older and stunned to see her again. I won’t reveal how he arrives back into the story, but I will mention that I love it that he clearly loves his wife of forty years. It’s a nice balance, because he never forgot Adaline, but he didn’t spend decades pining after her either, and when he makes a toast referring to his wife as the love of his life, I believed him. It would be a tragically sad story otherwise. You know what else was astonishingly believable? The casting for young Harrison Ford. We get some flashbacks, and I was honestly wondering how they could cast someone else to play Harrison Ford (I mean, we all saw him when he was that age…) but Anthony Ingruber is jaw-droppingly convincing. And I now desperately want a Han Solo origin story movie. Give the man a vest and a Wookie, it will completely work! The science is maybe less believable, and the ending is perhaps a little convenient…but they go through enough elaborate narration and explanation and acknowledgment of highly unlikely combinations of factors, with maybe just a little unspoken “oh, it’s really just magic” undertone…that I’m willing to ride along with them. I was happy to ride along for this whole movie. It was immersive and engaging and beautifully put together. Recommended! The premise seems very far-fetched, but the way you describe it makes it more worthwhile. Will have to check this one out.